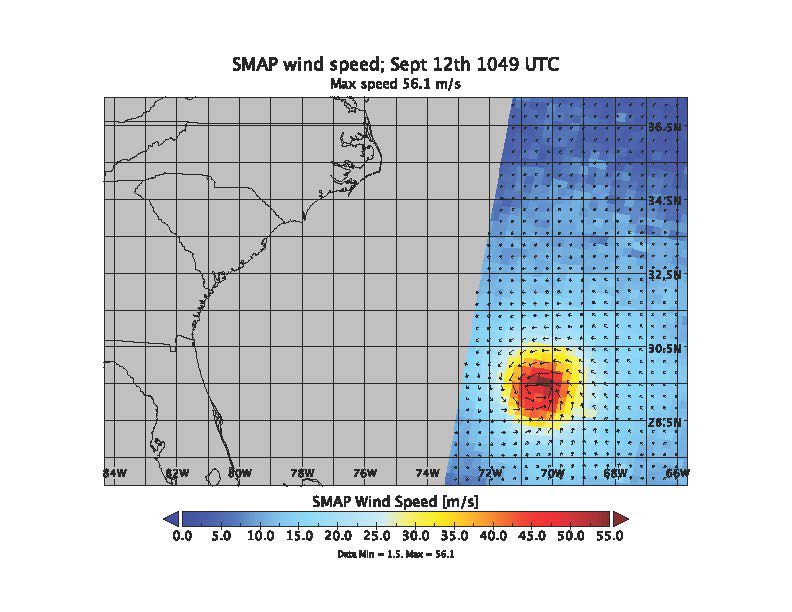 SMAP wind estimates over Hurricane Florence on Sept. 12, 2018 at 10:49 UTC and on Sept. 13, 2018 at 11:25 UTC. We see weakening of the hurricane from the 12th to the 13th; however, the overall size and energy of the storm has increased. The brightness temperatures have been shown to yield unprecedented sensitivity to extreme wind speeds as compared to conventional Ku and C-band scatterometers. SMAP is managed for NASA's Science Mission Directorate in Washington by NASA's Jet Propulsion Laboratory in Pasadena, California, with participation by NASA's Goddard Space Flight Center in Greenbelt, Maryland. JPL is responsible for project management, system engineering, instrument management, the radar instrument, mission operations and the ground data system. Goddard is responsible for the radiometer instrument. Both centers collaborate on the science data processing and delivery of science data products to the Alaska Satellite Facility and the National Snow and Ice Data Center for public distribution and archiving. JPL is managed for NASA by Caltech. 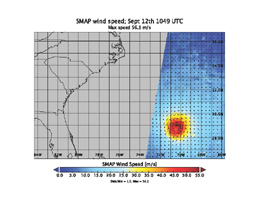 For more information about SMAP, visit http://smap.jpl.nasa.gov.